Speed through the iconic orange track as you explore Hot Wheels® City! Race as Shark Bite™, Chicane®, Bone Speeder™ and Dragon Blaster™ as you play mini games along the way! Discover interactive locations where kids can customize their car, or build their own track! Learning curriculum is woven throughout the app and naturally levels up as kids learn. With all of Hot Wheels® City to explore, 2 Supercharger challenges, Creation Stations and a Track Builder, your preschooler will gain the tools they need for kindergarten readiness, while having fun along the way! INCLUDES DRIVING, GAMING, RACING & MORE! TRACK BUILDER! 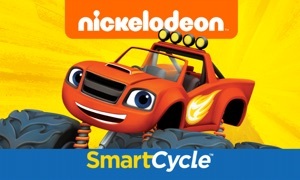 Kids can build their own Hot Wheels® track and take it for a test ride using the Smart Cycle® controls! Choose from the available track options and create a track that turns left, right, and even changes elevation! Once your track is complete, drive it in the digital space. Save up to three of your favorite tracks to play again! LET’S RIDE! 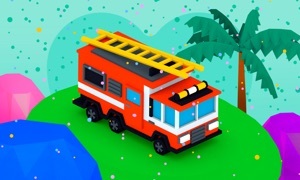 Explore Hot Wheels® City and discover interactive checkpoints while you collect energy and count by 1s, 10s, 5, and 2s. Curriculum includes counting by 1-30 sequentially, by tens 10-100, by five to 100 and by two to 30. Collect three numbers to get a power surge speed boost then pull into the Color Creation Station -to spray your car with different paint colors and cool effects. HOT WHEELS® CITY RACE! Kids pedal as fast as they can against their opponent to win the race! SUPERCHARGER CHALLENGES! Kids who add and subtract in two different challenges are rewarded with a huge speed boost across some of the most interesting track sections in the game. 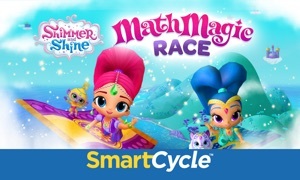 In the Shark Blast Challenge and Cobra Crunch Challenge kids are presented with addition and subtraction math problems — get the number of cars into the shark’s mouth and cobra’s mouth correctly and be turbo boosted past them to continue their race! For more information about the Fisher-Price® Think & Learn line of toys and apps, please visit: fisher-price.com/thinkandlearn. and ™ designate U.S. trademarks of Mattel, except as noted.